Here's a FREE, full color introductory guide to Custom Homes, Architectural Design, Interiors, and more. This image-packed glossary introduces the equipment, tools, tips, techniques, structural components, and design elements involved in home construction, interiors, and landscape design. Arm yourself with basic knowledge of home building, construction equipment, tools, terms, tips, techniques, and architecture. Use this guide for interior decorating and landscaping ideas. Or get inspired to build custom homes of your own. SOD HOUSE: An architectural style in which the walls, floors, and/or roof of a house are made of packed earth. 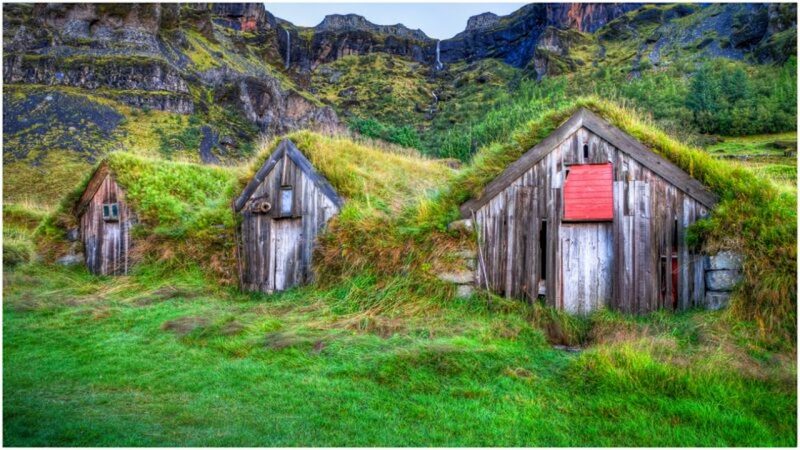 Shown below, custom homes in Iceland with sod roofs. Early American Architecture and vintage custom homes. Shipping Container Homes (design your own tiny custom homes). FRANK LLOYD WRIGHT custom homes and architecture.